Trim Healthy Mama is NOT a diet. I repeat, NOT a diet! OK, I guess technically speaking, by definition, it is a diet. However, I consider it more of a healthy living whole foods lifestyle. Before I got pregnant with my second child, I lost 35 pounds in 4 months by following the Trim Healthy Mama plan and working out. How awesomely crazy is that?! I've never been one to stick to diets because, well, who likes diets?! Even the word sounds so restrictive. And if I can't have chocolate? Ya, I'm out, not gonna happen! But I digress. Fast forward to present time, and now that I've birthed another tiny human from my body, my poor flabby body needs some self love and care. Let's get real, shall we? I gained about 35 pounds during my pregnancy with my second. (Which is exactly what I gained with my first!) I am, unfortunately, not one of those lucky moms that breastfeeds and looses all the pregnancy weight (plus some) in some incredibly short amount of time. Nope. I have to work hard and pay in blood, sweat and tears for every single ounce I loose. I also have to eat a very balanced diet of healthy fats and healthy carbs in order to maintain my milk supply, and I eat. A lot. Oh the hunger of a breastfeeding mom!!! Seriously though, it's crazy how hungry I get when I'm breastfeeding! So enough about that...on to the Trim Healthy Mama talk. 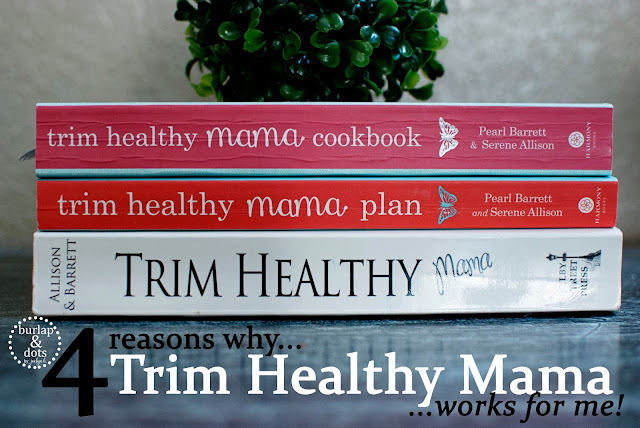 4 Reasons Why Trim Healthy Mama Works For Me! Trim Healthy Mama works very well for me. Will it work for everyone? Probably not, but maybe! I would like to share with you why I love this way of eating. I am no longer addicted to sugar and "bad" carbs! Really! I promise! Yes, I will still eat a chocolate chip cookie occasionally, or pop a few jelly beans in my mouth during Easter, but do I HAVE TO HAVE IT? Nope. I can just as easily walk away. Trim Healthy Mama (or THM as it's also known) offers several yummy "sweets" and dessert alternatives, but they are made using healthy ingredients! You can lose weight and eat your cake too! For breakfast even. And I LOVE the Trim Healthy Mama Stevia in my coffee! Once you get the hang of it, Trim Healthy Mama is easy. There is a slight learning curve, and I remember feeling a bit overwhelmed in the beginning while learning the plan, but I hung in there and figured out what worked for me. The sisters, co-authors and creators of Trim Healthy Mama, Pearl and Serene recently released an updated and more condensed version of the plan, in addition to their newest cookbook. The "new" book is an easier and shorter read. It also breaks down the plan in a more concise way. I still think the original book is definitely worth adding to your collection because it's packed with information and research and yummy recipes, but the new plan book is a little bit easier to read. In a nutshell, the basic idea is to separate your fats from your carbs, eliminate sugar or foods that can spike your blood sugar, and eat whole foods as much as possible. Pinkie-swear, I promise it works guys, it really works! After the learning curve, I didn't really think about it too much anymore, and it became just a way of life. I feel better, I look better (clear skin! ), and most of all, I know that what I'm eating is helping to nourish my second born since I'm still a breastfeeding mama. I have been back "on plan" since February of this year, and I've already lost 12 pounds! That may not be the most impressive number ever, but for this breastfeeding mama, it feels like a huge accomplishment! My husband also follows the Trim Healthy Mama (or Trim Healthy Man) plan, even though he hates to admit it. He can be a tad bit on the picky side sometimes, but honestly he likes most of the recipes I make. Even my 4 year old likes most of the recipes I make...especially anything with chocolate (don't we all!). It's easy to make myself dinner, but also for the whole family. This way of eating is still appropriate for growing kids, or people who don't have any pounds to lose. There are ways you can adapt it to work for your individual needs. 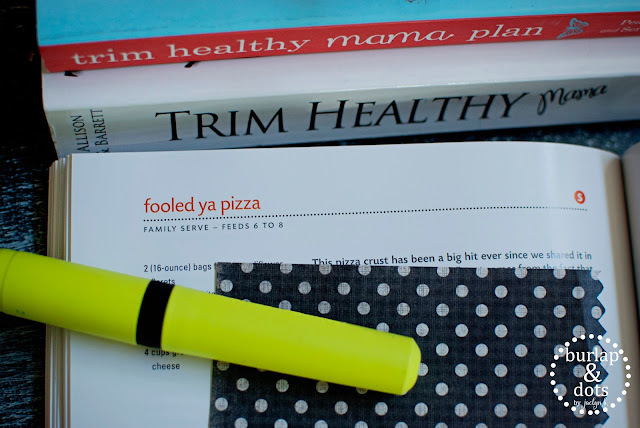 One of our favorite recipes for Family Night is the Fooled Ya Pizza (page 214 in the THM Cookbook). The sisters of Trim Healthy Mama have thoughtfully and purposely built their Trim Healthy Mama community. I purchased the subscription membership to their Trim Healthy Mama Forum which is chalk full of extras to help with your learning curve, or to inspire for every day. 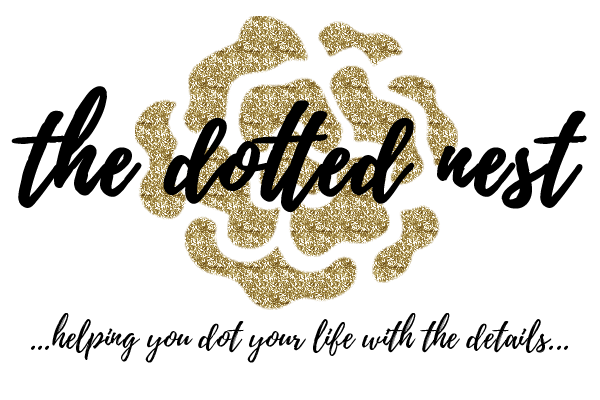 I have also found the Facebook groups to be very helpful, particularly the Pregnant and Nursing Mamas group. It's great to have a support system in place when you're goal is to lose a few pounds. If you're sitting there thinking, "ya, this is all fine and dandy, but isn't healthy food expensive?" Well, yes, healthy food and healthy lifestyles can be a bit pricey. However, it IS possible to do the plan without breaking the bank. There is an awesome Facebook group devoted just to doing Trim Healthy Mama as cheaply and cost effective as possible. Let me know if you'd like an add to the group! I've found several tips and tricks there, or heads up on grocery store sales for "on plan" items. The Trim Healthy Mama store offers good quantity and amazing quality that is actually quite affordable when compared to other brands elsewhere...and even more so when they run coupon codes or sales! Here's the Trim Healthy Mama store where you can purchase the books, and all of the food items. 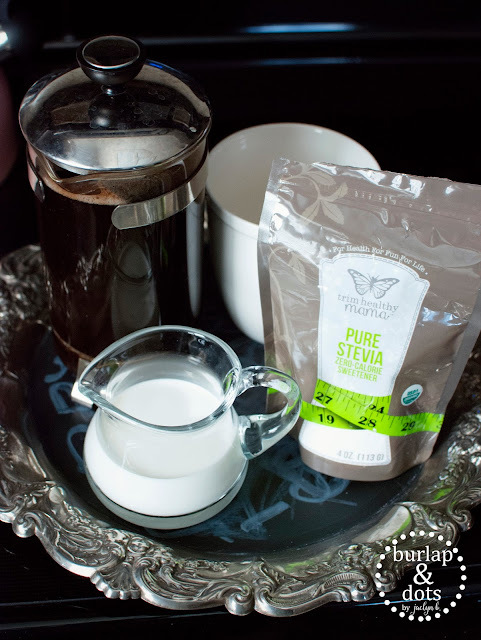 I love the Pure Stevia! It's my favorite stevia, and I don't find it to have any weird aftertaste like some brands have. Here's my favorite Baking Blend, perfect for Swiss Bread (page 196 in the THM Cookbook), or the Believe It Or Not Chocolate Chip Cookies (Page 320 in the THM Cookbook). Please let me know if you have any questions! I hope this inspires you to check out the plan and GO FOR IT! You can do this. We all start somewhere, right?